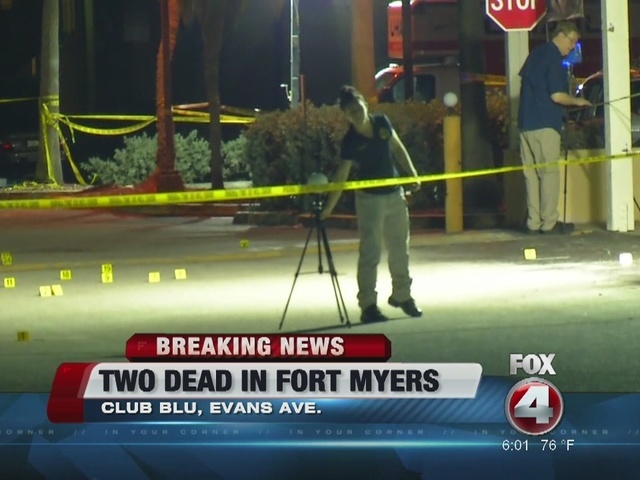 FORT MYERS, Fla. (AP) — Gunfire erupted at a nightclub hosting a swimsuit-themed party for teens in Florida, leaving two teens dead and at least 17 other people wounded, officials said Monday. 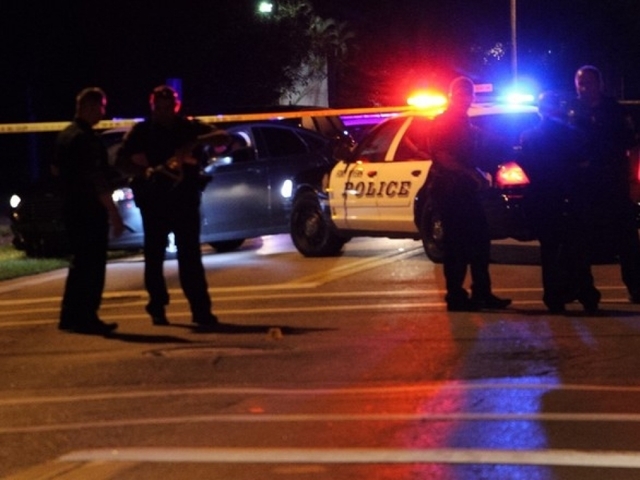 It was not immediately clear what triggered the violence, but Fort Myers police Capt. Jim Mulligan said the shooting was not an act of terror. Police detained three people and said the area around Club Blu had been deemed safe, Mulligan said. The slain teens were 14-year-old Sean Archilles and 18-year-old Stef'an Strawder, police said. Archilles lived about a mile from the nightclub, said his father, Jean Archilles. Archilles said his son loved to play football and basketball. "He liked to make people laugh. He's a funny kid. He's always joking," Jean Archilles said. He said he doesn't wish bad for the shooter. "When he lays down in his bed, how is he feeling about what he did? A 14-year-old kid!" Archilles said. "Is he thinking about his family, his friends? Because everybody has family and friends. Does he feel good about himself?" Four people were in the hospital. Two were in critical condition and two in fair condition, said Lisa Sgarlata, the chief administrative officer at Lee Memorial Health System. All of the other patients were treated and released. The victims ranged in ages from 12 to 27. Police said they want to talk to some of the victims who were treated and released from the hospital and haven't yet spoken with investigators. "It is imperative that all persons who were involved with this incident come forward so that this incident can be properly documented and statements obtained from all involved," Mulligan said. There were two active crime scenes — the club and a street in the area, which also remained closed as police investigated. The club is in a strip mall that includes a daycare center and is across the street from a large apartment complex. The shooting happened about 12:30 a.m. Monday, just as the club was closing and parents were arriving to pick up their children. Syreeta Gary told WFTX-TV her daughter ran to avoid being shot. Her daughter was OK, but her daughter's friend "got hit in the leg and luckily it's just her leg," she said. "Her dodging bullets and running, dropping in between cars, it's ridiculous that these kids have to go through this," Gary said. "They can't enjoy themselves because you have other people that have criminalistic minds and they just want to terrorize things." A post on Club Blu's Facebook page said there was armed security at the event. "We are deeply sorry for all involved," the post read. "We tried to give teens what we thought was a safe place to have a good time." Law enforcement removed some of police tape by Monday morning, allowing the media and public to get closer to the entrance to Club Blu. There were bullet holes in concrete planters and wooden support beams. Sheriff's evidence markers were still affixed to the holes. The letter "A'' was attached near a post, while nearby "L," ''M," ''N" and "O'' we're marked near a planter filled with scraggly foliage. "It breaks my heart. No family should have to endure this kind of pain," said Sylvia Bargouthi, a mother who didn't know any of the victims. "Children should be able to enjoy their life without being brutally murdered." Bargouthi carried a small stuffed animal with her and placed it near the club's entrance. State records online show the alcohol license for Club Blu was revoked June 7 because of an incident that occurred a year ago, but there were no additional details available, according to records from the Department of Business and Professional Regulation. The same records show that a complaint was filed in 2014 for "criminal activity" and that the club was given an official notice. The shooting comes more than a month after a nightclub shooting in Orlando that was the deadliest shooting in modern U.S. history. The shooting at the Pulse nightclub on June 12 left 49 victims dead and 53 others wounded. Associated Press writers Tamara Lush and Gary Fineout contributed to this report. This story has corrected the hospital official's title to chief administrative officer, not CEO. It also has corrected the victim's first name to Stef'an, not Ste'fan.